CALGARY, VANCOUVER, VICTORIA, TORONTO, NEW YORK CITY & LONDON, ENGLAND in 4 years! RSA students will be challenged to a high-energy fundraiser for their study trips. On the previous evening, all students will be put into teams, given a prop and a line of text, and then have a maximum of 20 hours to create a 10 minute play. Some may choose to work all 20 hours and work all night; others may work all the harder during the day of the performance, until the final moments before the show! 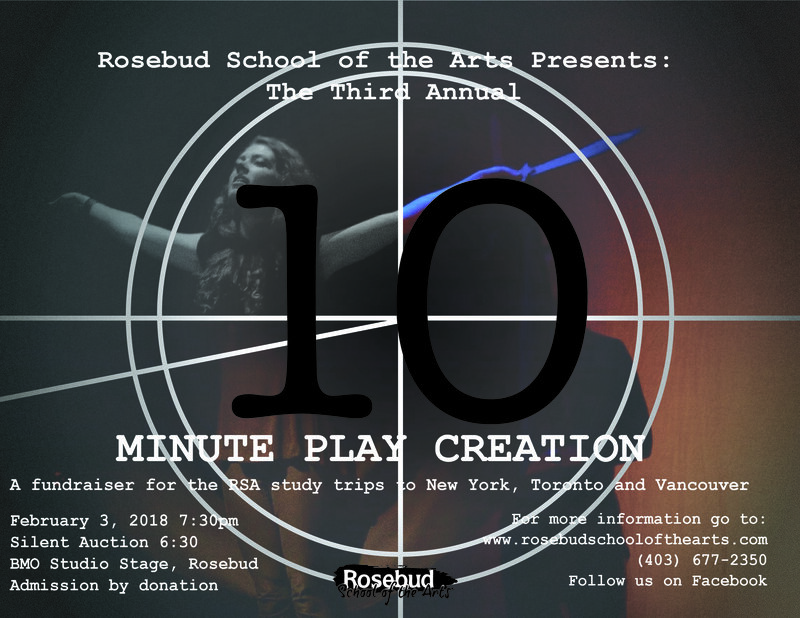 The 10 Minute Play Creation promises an exciting-sleep-deprived-impulse-driven performance you won’t want to miss! Calgary field trips are geared towards seeings a wide variety of different theatre in professional houses. Occasionally there will be talk backs or pre-show chats with the actors or production personnel. Travel to and from the theatre venue provides discussion time about the performance and its merits. Every student in the Certificate and Mentorship Programmes is required to attend at least one professional or semi-professional production a month. This trip gives Cerificate students an introduction to some of the theatre that happens in British Columbia, with an emphasis on the Christian-oriented theatre companies such as Pacific Theatre, Panic Squad, and Chemainus Theatre. Students participate in workshops with theatre professionals and attend shows at a wide variety of different tehatre companies. In addition, students explore alternative styles of whoship, tour art galleries, and have the opportunity to build deeper, more meaningful relationships with other students and RSA staff. In Mentorship level 1 and 2, students participate in a two-week field trip to one of the two major theatrical centres in the English-speaking world - London and New York, alternating each year. Students see world-class theatre, participate in workshops and talk-backs with West End or Broadway professionals, and take backstage tours of theatres like the Metropolitan Opera House or the Royal National Theatre. the London trip includes a vsit to Shakespeare's Globe Theatre and travel to Stratford-upon-Avon. the International Theatre Trip is a wonderful opportunity to gain a more global picture and a wider scope of the international theatre community. Students will experience being immersed in another culture and have the opportunity to build deeper, more meaningful relationships with other students and RSA staff.